" Wildness is something best measured in the dark. On black, moonless nights when the horizon goes limp, and every scratch and thud and snap of branch outside the tent touches off spot fires in your brain. Sort of like now. The sow grizzly is back again, circling, gulping down the dark and blowing it out again through her nose." So begins Gary Ferguson' s tale of his three-month odyssey at Hawks Rest in the heart of the Greater Yellowstone Ecosystem. Beginning with a hundred-mile hike to reach Hawks Rest, Ferguson recounts his adventures observing grizzly bears, tracking wolf packs, and encountering other wildlife in what is now the largest intact ecosystem in the temperate world. Along the way he meets an intriguing array of backcountry hikers, park rangers, elk hunters, outfitters, and wildlife biologists all grappling with the challenges of preserving this magnificent slice of wilderness. 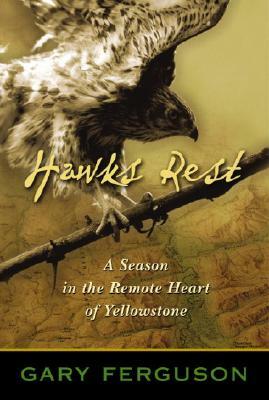 Personal, poignant, and often gripping, "Hawks Rest celebrates " this profusion of things fierce and vast and thrilling" as it chronicles the stresses that threaten America' s most beloved wilderness lands.